I must admit I have often used Peat Moss as a great seed starter and soil amendment. If you stop by your local nursery you will usually see bags of Peat Moss for sale. Most likely it’s Canadian Sphagnum Peat Moss. Not to be confused with living Sphagnum Moss, Sphagnum Peat Moss is partially decomposed, slightly acidic and takes many, many years to form. Peat Moss got it’s start in melted glaciers after the Ice Age. 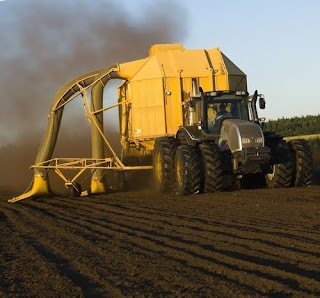 Today Peat Moss is harvested by draining surface area water, clearing vegetation and letting it dry under sun and wind. It is then vacuumed with harvesting machinery at 100 acres a day. In the year 2000 Canada exported 1.2 million tons of Peat Moss to the United States. According to the Canadian Sphagnum Peat Moss Association (CSPMA), which is run by the 18 Peat Moss producers that represent 95% of the industry, Canadian Peat Moss is a sustainable industry. A sustainable alternative to mined Peat Moss? Coir/Coconut Dust/Coconut Peat-Short fibers of coconut shells considered to be a renewable resource that has long been considered a waste product in Southeast Asia. Auburn University and Arkansas University recently compared Peat Moss and Coir and found Coir to be comparable noting that it was less acidic, wet easier, decomposed slower and withstood pressure better then Peat Moss. Also the larger size brick form of coir expands to three times it size but is light and compact to carry. I just bought a big "block" of coir, to ammend my silt-like perpetually dry garden soil. So far, I'm really liking it. Great blog. Really nice pix. Thanks for the tip on coir. I use ungodly amounts of peat, mostly in soil blocks (trying to avoid plastic). For some time I've meant to look for a substitute. Won't use peat, on principle. We have very little natural peat bog in South Africa, supporting highly endangered plants and animals, in competition with people who always want more water. Someone else is unhappy about flight transport of coir. I guess best would be to seek out some sort farming/industrial plant waste which is local. We have bales of straw from the wheatlands. Sustainable or not, I still question the methods used to harvest it. I've noticed that in pre-prepared potting soils it can be a quite challenge to source ones without peat moss. I like Coir personally, and of course compost everything so I don't have to buy soil too often. CVF, if you want to avoid using peat there are some orchid mixes that don't contain it. I would like to know how exactly peat is sustainable when it takes so long to create and is in a very limited area. Not to mention the destruction of ecosystems to harvest it.